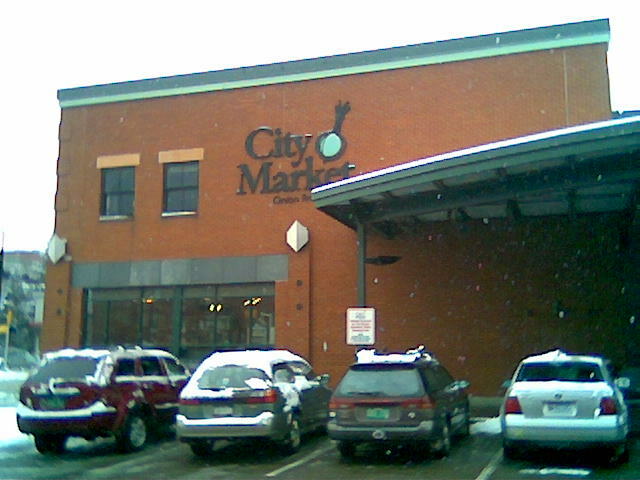 Ah City Market one of the Burlington Vermont epicenters of hippie, hipster, loca/localvore, foodie food. I like City Market, there is a great selection of local foodstuffs, and produce. This results in a spendy, but tasty grocery haul. I recently gleaned from some of my friends that they’re big fans of the pesto chicken sandwich, I was immediately reminded of my own favorite pesto infused sandwich from Sugarsnap. I was suprised I hadn’t tried City Market’s sandwich counter, as I shop there and sometimes will even get a breakfast sandwich from their morning buffet. Choice of Klingers bread (I chose wheat), mesclun greens, fresh tomatoes, pesto (both sides of bread), grilled chicken (cold), fresh mozzarella. 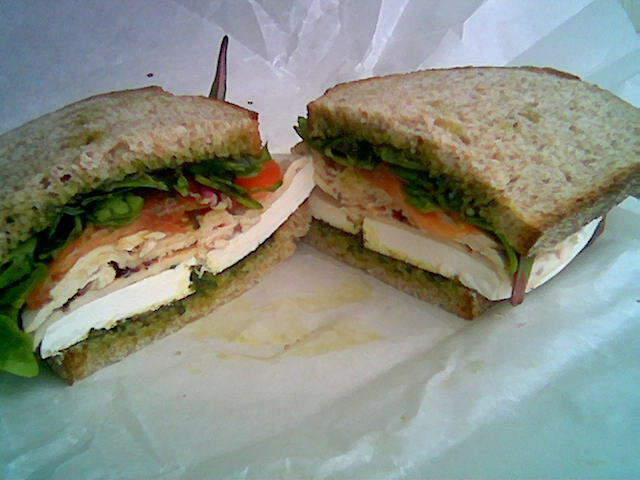 The pesto chicken sandwich is like an insalata caprese, with added chicken in a sandwich form. Everything is very fresh, there is a nice balance of texture, the chicken breast has nice diamond grill marks, and has been run through a deli slicer? as it’s nice and thin. I personally find insalata caprese to be a little bland, and just like the salad I found this sandwich a little lacking in flavor. Maybe some acid would help (balsamic dressing, dried cranberries?). On the positive side, this sandwich is massive, you could easily split it with a friend, and nosh on some of the plethora of baked goods from area bakers or some of the bulk goods as I did. 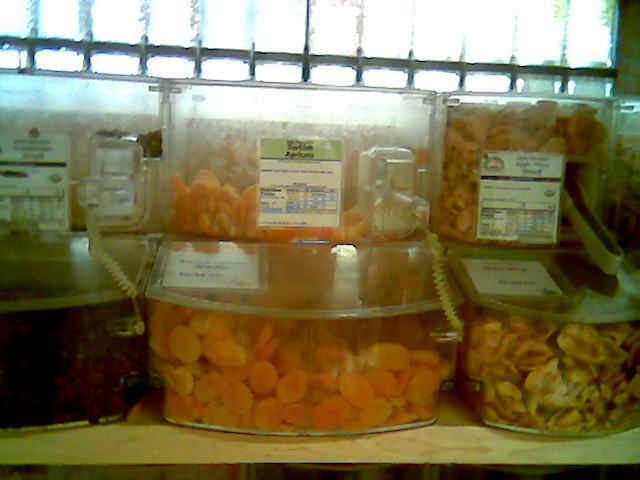 I chose dried Turkish apricots, one of my favorite natural snacks; I think apricots are much better dried than fresh. The sandwich was $7.50 before tax, a good deal, I’ll be back to try City Market’s other sandwiches (their sandwich counter is in the baked goods end of the store). The dried apricots are $3.99 a pound.